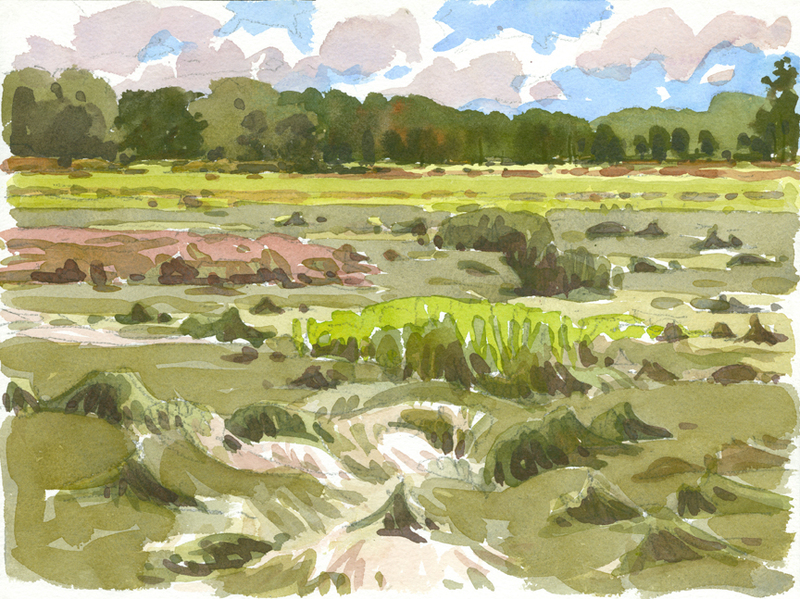 Posted on October 21, 2015 by Barry V.
Back in August, I visited the Barnstable Great Marsh – the largest salt marsh on Cape Cod. At 3,000 acres, it’s an impressive wetland. But the largest contiguous salt marsh north of Long Island lies along the North Shore of Massachusetts. At 25,000 acres, this system, also known as “the Great Marsh”, sprawls from Gloucester thru Essex, Ipswich, Rowley, Newbury, and Newburyport before ending in Salisbury on the New Hampshire line. It’s a massive complex of marshes, barrier beaches, tidal rivers, estuaries and mudflats – much of it protected land owned by the Parker River National Wildlife Refuge, the Trustees of Reservations, the Essex County Greenbelt and Mass Audubon. 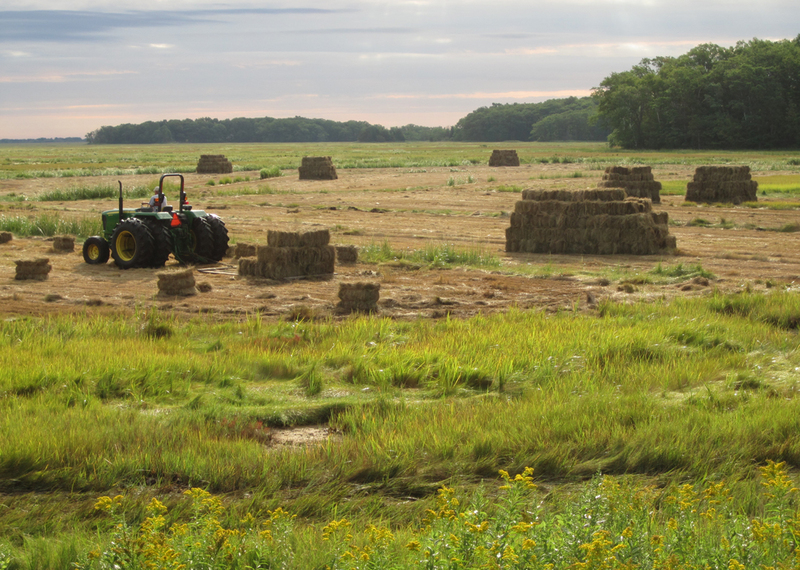 Heading down Rte 1A from Newburyport this morning, I pass a haying operation on the upper reaches of the Great Marsh in Rowley. Men and tractors are piling bales into picturesque heaps, as the gathering dawn light creeps across the landscape. As I arrive at the parking area for Rough Meadows, a fresh Black Swallowtail butterfly drifts past, and I later see it nectaring on New England Aster. 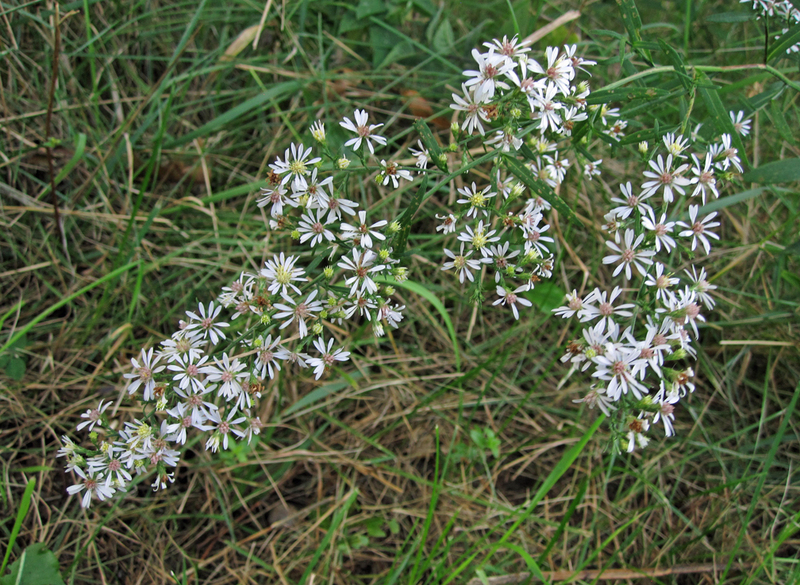 Indeed, mid-September is “aster season” in Massachusetts, and the trails at Rough Meadows are lined with a variety of species, ranging from the large, colorful New England aster to the tiny, delicate calico aster. In central Massachusetts, where I live, mosquito season has passed, and days outdoors are thankfully bug-free by this time of year. NOT SO in the North Shore marshes! Whenever I stopped along the trails, I was plagued by the small dark saltmarsh mosquitos. I concluded that they must be attracted to movement, however, because once I settled down to paint in one spot, the mosquitos left me alone! Professor Chandler’s Long Walk traverses several wooded hills that rise like islands out of the surrounding marsh, and at various overlooks you can take in the sweep of the marsh and admire the variety of colors and textures. 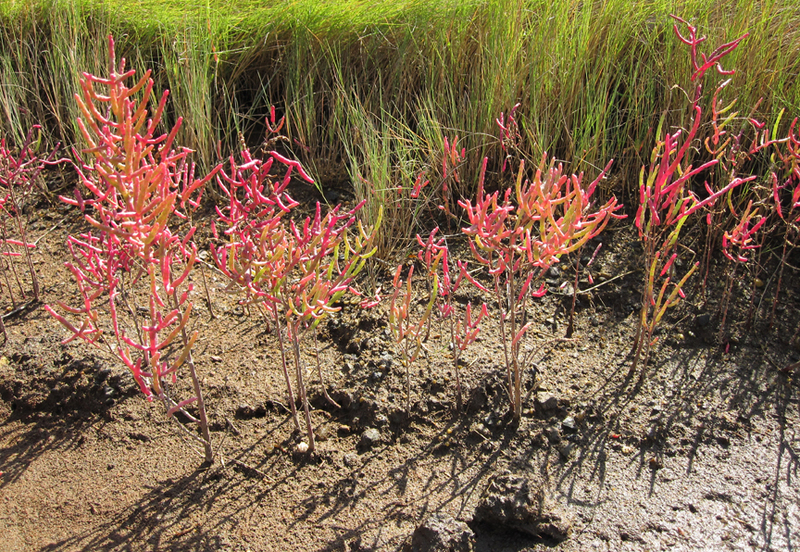 Patches of glasswort create bold swatches of crimson, and seaside goldenrod adds touches of buttery yellow. 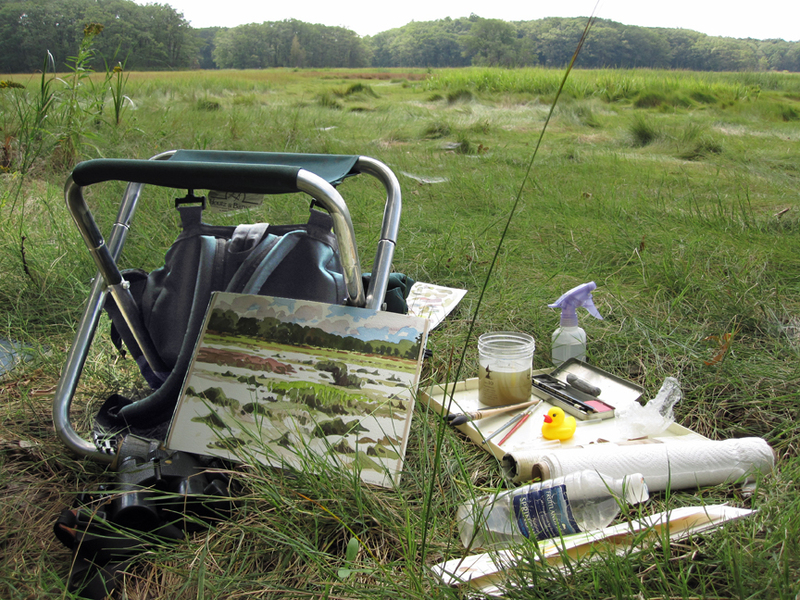 Out at the end of Appy’s Way, I set-up my painting outfit and start a landscape looking back towards Rte 1A. My finished painting does indeed look like a “rough meadow”, don’t you think? Back at the parking area, I notice an interesting view of the marsh – looking down between the trees along the Kestrel Trail. In the foreground is a thick patch of Queen Anne’s lace, now gone to seed and forming those ball-like clusters atop each stalk. I make a quick pencil sketch to record the scene. 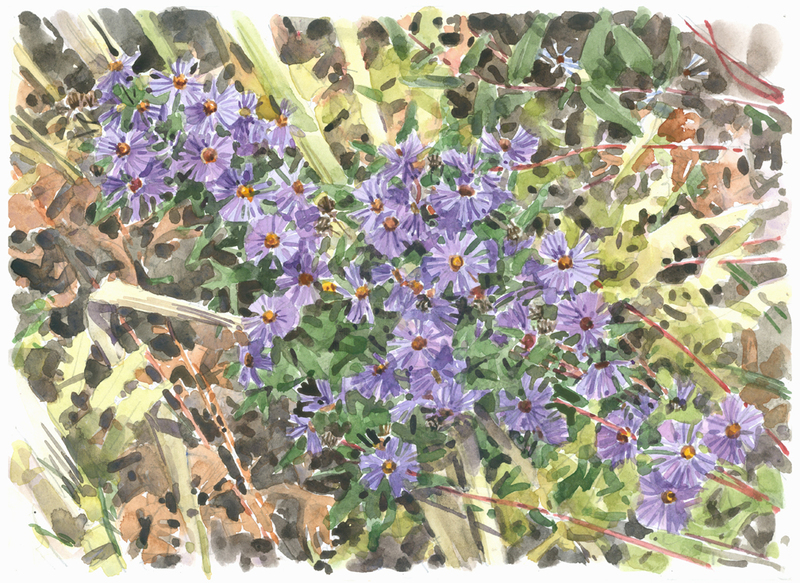 This entry was posted in Artists, Barry Van Dusen Residency, News and tagged Aster Season, Barry Van Dusen, Black Swallowtail, Calico aster, Glasswort, joppa flats, Landscape, New England Aster, Queen Anne's Lace, Rough Meadows, Rough Meadows Wildlife Sanctuary, Rowley, Rubber Duck, Saltmarsh mosquitos ugh, Seaside Goldenrod, Watercolor, Woodson Museum on October 21, 2015 by Barry V..
Loving this blog. 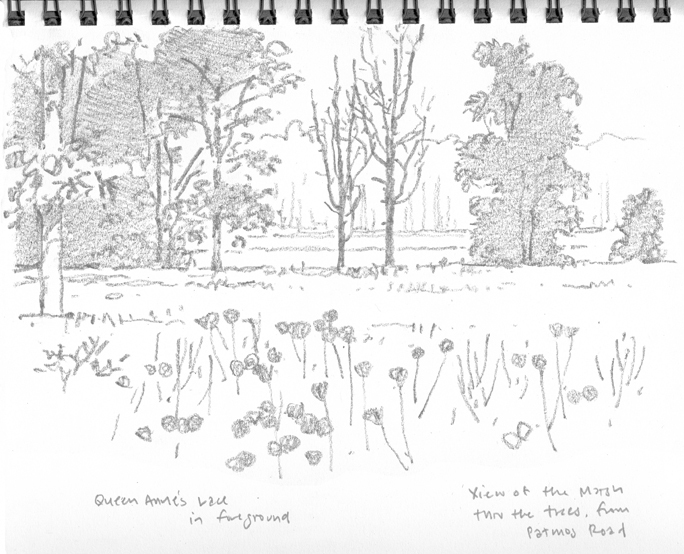 As a native cape codder living on the west coast, and a lifelong painter and sketcher, i find delight in reading Barry’s posts about his art-outings , and in seeing both his sketches and works in progress. I am inspired! Thank you for the kinds words about our blog and Barry’s posts. I’m so glad you have been enjoying his voyage around the state as he paints and sketches at different Mass Audubon sanctuaries. I so enjoy these commentaries. Thank you! Thank you for the kind comment. We are glad you are enjoying the blog.